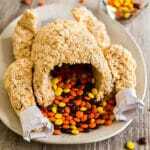 Be the hero we all need this Thanksgiving and make a Rice Krispie Treat Turkey. Cover the cup with foil and make sure the non-stick side is up on that as well. Spray it well with cooking spray. Lay out a large piece of foil with the non-stick side up next to the serving platter. Spray a mixing spoon with cooking spray and stir in the marshmallows until they've melted. Remove the pan from the heat. Add your Rice Krispies and stir until well combined. Pour this mixture onto the piece of non-stick foil and allow it to cool for a moment or two (you don't want it to cool completely, just slightly so that you don't burn yourself). Working fast, divide the Rice Krispie Treat mixture so that there's 2/3 of it to make the body and set 1/3 of it to the side to make the wings and drumsticks. Starting with the 2/3 portion of the Rice Krispie Treat mixture, take a small amount of it and create a base about an inch thick on the serving platter. Place the cup on it's side onto the base so that open part of the cup is slightly off of the base where the turkey's opening will be so the majority of the cup is laying on the base. Build the rest of Rice Krispie Treat mixture around the cup to create the turkey's carcass with the cup in it's cavity (once this is set you'll be able to pull the cup out and stuff it with candy). Make sure the mixture around the cavity isn't too thin. Be sure to press the mixture in well so that it's not too loose when it dries. Next, take the other 1/3 of the Rice Krispie Treat mixture and divide it into four parts. Use each part to mold two drumsticks and two wings and set them aside and make sure you press them into shape tightly. (I kept these on the a separate pan lined with non-stick foil- keep in mind that you'll want to shape the wings so that the thinner back parts of them go up in different directions since they will be on either side of the Turkey). Cover everything with the nonstick side of the foil and allow it to rest and set for at least 30 minutes in the refrigerator (overnight is preferable). To make the bone end of the drumsticks, take strips of white paper, and fold them in half length-wise. Cut half way up along the fold every half inch or s and wrap it around the ends of drumsticks and secure with a piece of clear tape. Use toothpicks to carefully secure your drums and wings to the turkey (this can be a bit tricky and you'll need to rig it up the right certain spots depending on your drumsticks and gravity). Stuff the turkey with candy. Serve immediately or cover with non-stick foil until you're ready to serve. One of our readers Rose Klein gave this awesome tip, "Just made a turkey following your recipe and wanted to add that it looks nicely roasted if you gently dust it with cinnamon, sugar and butter melted into a glaze. It gives it a nice toasty coloring, a slight taste, and cools to a nice moist looking sheen." Thanks Rose!